Democrats got what they wanted when Rep. Darrell Issa (R., Calif.) announced plans to retire earlier this month, but the group of liberal activists who helped push him out is starting to voice concerns about winning his seat. Flip the 49th Neighbors in Action protested weekly outside Issa's office in the North San Diego district; with Issa in the race, the seat was considered the GOP's most vulnerable in the nation. However, the landscape has shifted significantly since the nine-term veteran Republican bowed out. Topping the list of Democratic concerns is the possibility that two Republicans with strong name recognition could emerge from the June primary as the top vote-getters in the politically divided district. Because of the state's primary system—which allows only the top two candidates receiving the most votes, regardless of party affiliation, to run in the general—Democrats theoretically could be shutout entirely. Flip the 49th is so worried it held an "emergency" strategy-session conference call Tuesday night that organizers say more than 300 joined. Organizers on the call referred to the "Pete Aguilar" rule as a warning to Democratic activists in the district. A nearby district in Southern California was expected to go to a Democrat with Aguilar, at that time the mayor of Redlands, seen as the front-runner. However, the Democrats split the vote, allowing two Republicans to compete in the fall and deliver the seat to Rep. Gary Miller, a Republican. Aguilar came back to win the seat two years later, when Miller decided to retire. The 49th district is far more politically divided than Aguilar's. The district straddles North San Diego County and the more conservative Orange County. It also includes the major military installation of Camp Pendleton, home to more than 100,000 Marines, their families, and thousands of veterans. Hillary Clinton won it with 50.2 percent of the vote in 2016, but Republicans have a seven-point voter-registration advantage. Democrats are working to narrow that gap with a registration drive and early phone-banking. The chances of the doomsday Democratic scenario increase if there are multiple Democrats running for the seat to divide the party's votes into small fractions with only two strong GOP candidates splitting Republican votes evenly. "The good news is we got rid of Issa—thanks to all of you who were active in being vocal with him about where you stand," Ellen Montanari, who organized the anti-Issa protests for Flip the 49th, told the conference call. "Now for the bad news … we no longer have a common enemy, and everybody and his brother is running for office." Terra Lawson-Remer, another Democratic organizer on the call, joked that she would like to send all the Democratic candidates to "Survivor" island to compete for the top two slots. "I would be the first to admit that I would like to do is to ship all these candidates to a desert island for a season of Survivor for the top two who make it to the end of the season [get] to run in the district," she said. "But because we can't do that, I think we have to think about other options." At last count, there are five serious Democratic contenders: Doug Applegate, who Issa beat by only 1,600 votes in 2016; Sara Jacobs, the granddaughter heiress of Qualcomm co-founder and billionaire Irwin Jacobs; environmental lawyer Mike Levin; real estate investor Paul Kerr; and lawyer Christina Prejean. Meanwhile, the Republican field so far only includes three strong candidates with high name recognition: San Diego Supervisor Kristin Gaspar; Board of Equalization member and former assemblywoman Diane Harkey; and Assemblyman Rocky Chavez. Gaspar was the latest local public official to throw her hat in the ring, announcing her decision to run earlier this week. Two days later she unveiled a slew of high-profile endorsements, including from House Foreign Affairs Committee Chairman Ed Royce, (R., Calif.), who represents Orange County and announced his retirement earlier this month, San Diego Mayor Kevin Faulconer, the top GOP big-city mayor in the country, and San Diego City Councilman Scott Sherman. "Kristin Gaspar is exactly the kind of candidate Republicans should be putting forward to change Washington," Royce said in a statement. "Kristin has real-world business experience as a CFO of her family's healthcare practice, service in local government as mayor of a coastal city and chairwoman of the san Diego County Board of Supervisors, and deeply involved in her community as a mother and mentor." Other lower-profile GOP candidates mulling the race include San Juan Capistrano Councilman Brian Maryott and patent attorney Joshua Schoonover. Local radio talk-show host and former San Diego city councilman Carl DeMaio could also jump in. DeMaio's radio show has a huge GOP following throughout San Diego and he is also currently leading a campaign to repeal the state's gas tax increase. DeMaio ran an unsuccessful campaign for Congress to represent the neighboring 52nd district in 2014. One organizer on the call said another major concern is that the new GOP field of candidates is not as "interchangeable with Trump as Darrell Issa was." They also stressed a forceful message: Put party loyalty over candidate preference. They repeatedly urged the activists to consider whether they wanted to move the seat to the Democrat column or vote for their favorite candidate. "This is one of seven districts that was won by Hillary but a Republican Congress member was able to win, and this is part of the strategy that taking back the House goes through California, and we don't want to forget that," said David Lagstein, one of Flip the 49th's founders and the local SEIU's political director. Lagstein and other organizers told the activists that they wanted to hold a "viability" town hall tentatively planned for mid-February to determine the strongest pair of Democrats in the race and encourage the "less viable" others to quickly drop out. Democratic leaders may have a bit of an uphill battle winnowing their field. California election rules prevent candidates who have officially filed with the state to have their names removed from the ballot if they drop out. An informal "snapshot" poll of the roughly 300 conference-call participants Tuesday night signaled that 51 percent favored Applegate as their candidate of choice, with Levin coming in second with 32 percent, Jacobs garnering just 11 percent, Prejean four percent, and Kerr taking just one percent. Democratic organizers are quick to note that the 28-year-old Jacobs, despite her youth, as well as Kerr, have ample personal funds to spend on the race. Before Jacobs jumped in the race late last fall, the Democratic Party establishment seemed to be endorsing Levin even though Applegate came within 1,600 votes of beating Issa in 2016. The shift of support to Levin happened early last year in reaction to reports late in the 2016 that Applegate stalked, harassed, and threatened his ex-wife, who was granted two restraining orders against him. Court records also surfaced late in the campaign showing that he was charged with driving under the influence in 2000 and pled guilty to reckless driving. Such revelations would be a deadly combination in any campaign, but are particularly lethal in the wake of the #metoo movement. After the informal conference-call vote favoring Applegate, the organizers quickly asked participants if they prioritized keeping the seat in Democratic hands rather than sticking with the Democratic candidate. "I'll be honest, I'm pleased to hear this: 80 percent of people said flipping the 49th is more important than any candidate," Lagstein said. The group's organizers expressed concern that organizing town hall-type events takes money and a strong team of volunteers. 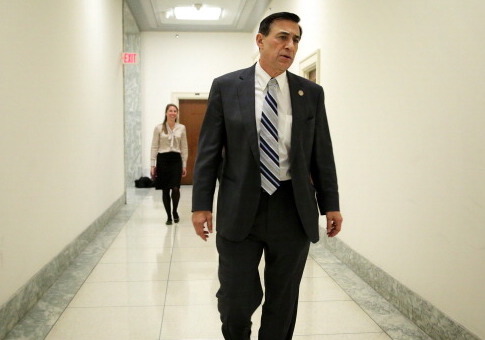 It is unclear how much Flip the 49th spent on its efforts against Issa last year. After failing to disclose its donors for month, the group in mid-December reported that it had collected $440,000 last year, including a $100,000 check from Jane Fonda and smaller checks from several other Hollywood stars, including Leonardo DiCaprio, comedian Bill Maher, actor Ted Danson, and Jay Leno through his JDM Foundation. The Fonda check spurred a counter-protest from veteran groups in the district, home to Camp Pendleton, a massive Marine base where 200,000 marines train and their families live. The vets referred to Fonda as "Hanoi Jane," and a traitor, recalling her controversial 1972 photo shoot in North Vietnam, where she was photographed sitting behind an enemy anti-aircraft gun. This entry was posted in Politics and tagged 2018 Election, California, Darrell Issa, Democrats. Bookmark the permalink.